(Nanowerk Spotlight) Well-defined complex nanostructures for metamaterials with unique optical properties – such as negative refractive index, strong artificial optical activity and perfect absorption – are usually prepared by top-down approaches, including direct laser writing, multiple e-beam lithography, and membrane projection lithography. However, these methods have two critical drawbacks: 1) Large-scale device fabrication is practically impossible due to time and energy consuming process; and 2), the operating window is limited (not working in visible or UV regime) due to large feature size of the structures. In a recent breakthrough, scientists in Korea have combined block copolymer (BCP) self-assembly and an anodized aluminum oxide (AAO) template to fabricate unique complex nanostructures over a large (centimeter) area. The team, led by Jin Kon Kim, a professor in the Department of Chemical Engineering at Pohang University of Science and Technology (POSTECH), and Director of National Creativity Research Initiative Program for Smart Block Copolymers, and Junsuk Rho, a professor in the Department of Chemical Engineering at POSTECH, reports their findings in NPG Asia Materials ("Accordion-like plasmonic silver nanorod array exhibiting multiple electromagnetic responses"). In this work, the scientists introduce a novel method to fabricate a high-density array of plasmonic nanorods over a large area (2.5cm x 2.5cm), exhibiting multiple electromagnetic responses. The paper demonstrates the fabrication of sophisticated nanostructures that are difficult to realize through a top–down process in a large optical device by taking advantage of BCP self-assembly. "Though block copolymers self-assemble into various nanodomains such as lamellae, gyroids, cylinders, and spheres, these nanostructures cannot provide complex plasmonic metamaterials with unique optical properties," Kim tells Nanowerk. "To address this issue, we confined the lamellae-forming polystyrene-block-poly (methyl methacrylate) copolymer (PS-b-PMMA) inside the cylindrical pores of an AAO template grafted with thin neutral brush layers to form stacked lamellar rods, which have not been reported in previous works." 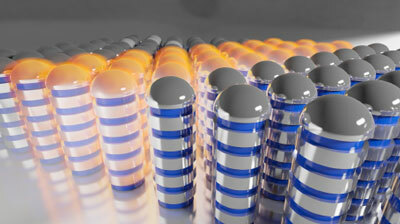 After the AAO template was removed, a 5-nm-thick layer of silver was thermally deposited on only the polystyrene nanodomains, generating 'accordion-like' silver nanorods with one hemispherical cover and 5 side stripes over a large area. Due to unique geometry of the nanostructures, the array has two magnetic responses and one electric response from visible to near-infrared (NIR) wavelength. Through finite difference time domain (FDTD) simulations, the scientists determined the Transmittance (T) dip at 600 nm to correspond to a magnetic response, while the other dips at 800 and 1200 nm corresponded to electric responses. These multiple resonances are specifically applicable for multi-analyte detection. Furthermore, magnetic response is known to be an essential optical property for realizing metamaterials with negative refractive index, which makes this work a contribution to the commercialization of practical metamaterials working in visible or NIR regime. "Our fabrication method is well suited to make multi-analyte sensors, anti-transmittance films, and metamaterials with unique optical properties, such as negative refractive index, and perfect absorption," notes Kim. "Other extraordinary optical properties, such as circular dichroism, could be obtained by introducing chirality on the BCP nanostructures," he adds. "Although we fabricated complex plasmonic nanostructures, the generation of a single or double helix will remain a challenge in BCP self-assembly."